Beautiful Commemorative American Revolution Bicentennial Certificate from the Second New Haven Bank 1776 - 1976. 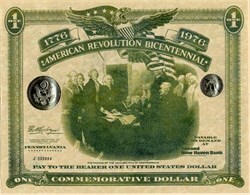 This historic document was printed by the Colonial Bancorp Company and has a famous scene from the American Revolution. There is also a gold seal of the Liberty Bell and a Presidential seal affixed to the face.